Fig. 1. 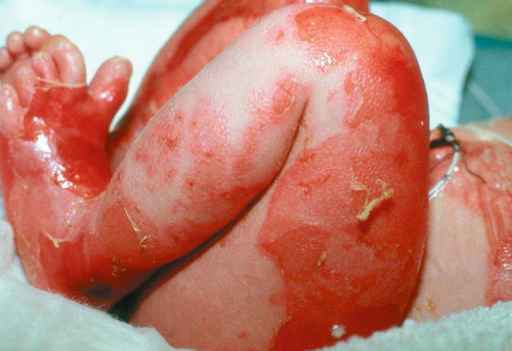 Epidermolysis bullosa mimics scalded skin from a hot liquid in this infant. The distribution of this disease mimics injury patterns that are usually found in children struggling to get away from the heat source. A bulla (blister) is also seen on the proximal thigh. Photo courtesy of Jonathan I. Groner, md. See Color Plate I, following page 240.
recessive trait (24). EB patients range from those with a relatively minor skin disorder to patients who are severely disfigured. In patients with severe disease, ill-fitting shoes, the application of a bandage, or even the use of an automated blood pressure cuff can cause skin damage. Newborns with severe EB may present with peeling and blistering (bullae) of the skin at intrauterine pressure points, particularly the elbows, knees, and ankles (Fig. 1). The lesions look strikingly similar to partial thickness burns and are treated with protective dressings. In older children, trivial trauma, such as a fall, may lead to large areas of partial-thickness (and sometimes full-thickness) skin injury that may be confused with an intentional burn injury. 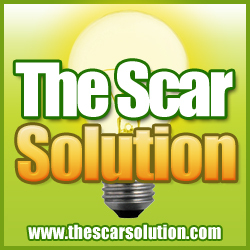 Fortunately, many children with EB have both a family and a personal history of chronic cutaneous scarring from past injuries that allows for the appropriate diagnosis. Patients with EB who present with severe scarring will develop pseudosyndactyly of the digits. In longstanding cases (usually beyond childhood), squamous cell cancer can develop in the chronically damaged skin. Fig. 2. 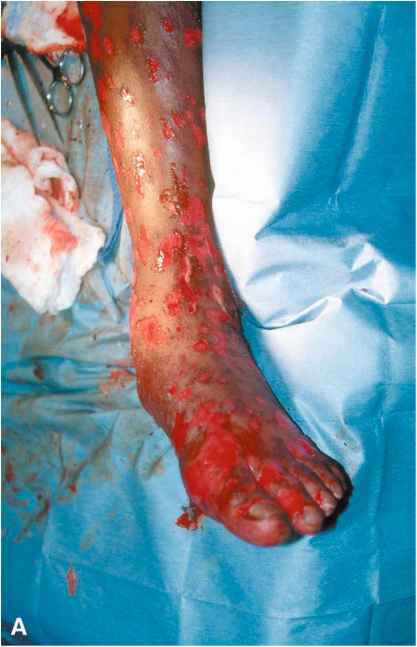 Stevens-Johnson Syndrome in the distal lower extremity intraoperatively (A) and showing healed lesions (B). These lesions mimic thermal trauma, such as that caused by cigarette burns or wounds induced with a heated implement. Photo courtesy of Jonathan I. Groner, md. See Color Plate II, following page 240.
exfoliative erythroderma. Figure 2A, B illustrate acute and healed dermatologic sequelae of SJS in a child. Such lesions could be confused with cigarette burns or other thermal injury with an implement. Children with Ehler-Danlos syndrome are not, in general, born with abnormal-appearing skin and do not develop burn-like lesions from trivial trauma. Patients with Ehler-Danlos do, however, develop large soft-tissue wounds in response to soft-tissue trauma. A blow to the tibial area (e.g., from a soccer opponent's kick or a bicycle pedal) may result in a large soft-tissue wound extending to the periosteum. The key to the diagnosis is an examination of the patient's knees: most children with Ehler-Danlos have multiple scars from previous trivial soft tissue trauma. In addition, a parent may be afflicted with the disease and have similar scarring. Idiopathic palmoplantar eccrine hidradenitis (IPPH) is characterized by painful erythematous plantar nodules that may arise following intense physical activity. IPPH is not a truly traumatic lesion (microscopic examination demonstrates neutrophilic infiltrate around and within the eccrine sweat apparatus) and generally resolves after a few days' rest (27).